This is a long chapter, with a fair bit going on, as we move towards the climax of the book. First, a short flashback of a scene that was skipped over in the last chapter – Nita going back to Wellakh, making sure that the stream of consciousness was taken out of Dairine’s information feed to Dad’s phone, and talking to Neleid again. Neleid mentions that Dairine is really ‘on fire’, as it were, with her sun-wizardry studies, and they talk about the possibility of Dairine sleeping over to avoid the long transits every day, but agree that it doesn’t seem necessary until Neleid and Papa Callahan have their meeting, and before Dairine suggests it herself. Nita mind-talks with Kit a little before he heads off to church, and asks him to let her know when he’s going to head back to Mars, because she wants to come too, but Kit doesn’t sound too enthusiastic about that. Sure enough, when Nita heads over to the Rodriguez house, Carmela tells her that Kit came home from church and headed straight off to Mars first thing. The girls chat about the work that Carmela is still doing on translating the messages from the archival site in Arsia Mons, and how the text seems to fall into two categories – very slanted, propagandist history, with plenty of loaded adjectives about the struggle between the two factions, and this one evocative poem that doesn’t make much sense yet. Okay, so last week, we left off with Kit transiting back home after his weird flashback experience of the not-really-native Martian people from hundreds of thousands of years ago. In this chapter, as it seems to me, the plot gets a lot more complicated, partly because Nita’s POV and Kit’s start to alternate faster. Nita stays behind on Mars to cover up the site from Earth-orignating artificial satellites, after the boys leave. She gets a very brief vision of a Martian pop culture character from her own childhood – Marvin the Martian from the Bugs Bunny cartoons, though he isn’t named as such, but uses his catchphrase. Nita suggests to Bobo that he should prepare any available counterspell for an Illudium Q-36 Explosive Space Modulator. Nita also uses Bobo to get a replay of Kit’s experiences with Aurirelde, or at least the beginning of them. She’s able to figure out that though the appearance of Aurirelde was based on Kit’s fantasies of the Barsoom books, she’s based on a Shamask-Eilith person, and penetrates the illusion to perceive Aurirelde’s true appearance, which has gray skin and isn’t as exotically pretty by human standards, but still humanoid and relatable. She has Bobo try to run the name-analysis ‘wizard’ on Aurirelde to learn more about her – and the replay wizardry, which was running off the stored wizardry at the site, crashes partway through. Bobo tells Nita that he’ll keep working on analyzing the incomplete data. Okay, so, the points of view are starting to deviate a bit from the straight ‘Nita’s chapter, Kit’s chapter’ routine that we’ve had uninterrupted for the past six chapters. Nita has a short passage in her POV for the first few pages, but then it goes back to Kit for the rest, and his section is more critical to the plot, so I’ll start with his part. Rorsik starts to throw around threats about how Khretef and Aurilelde are in league with the enemy, and Aurilelde, who appears to be some kind of prophet, makes several remarkable pronouncements that appear to involve her seeing through the fourth wall of the re-enactment, about how wizards from another world have come to their planet, about how they’ve found the think that Khretef was looking for, ‘the Nascence’, and begun the tests… and that one of them is already here! Note: If you haven’t read Young Wizards #1, “So you want to be a wizard”, and you care about the ending being spoiled, note that there are spoilers further down near the end of the blog entry. There’s more really cool stuff that happened in this chapter of the book, which is back to focusing on Kit and the guys, though it looks like that alternating structure might be breaking down soon. From Stokes they move on to another wizardly ‘test site’ on Mars, and the first thing that they find out is that there’s going to be a witness, who they’ll have to both protect and hide the action from – the Spirit Rover. 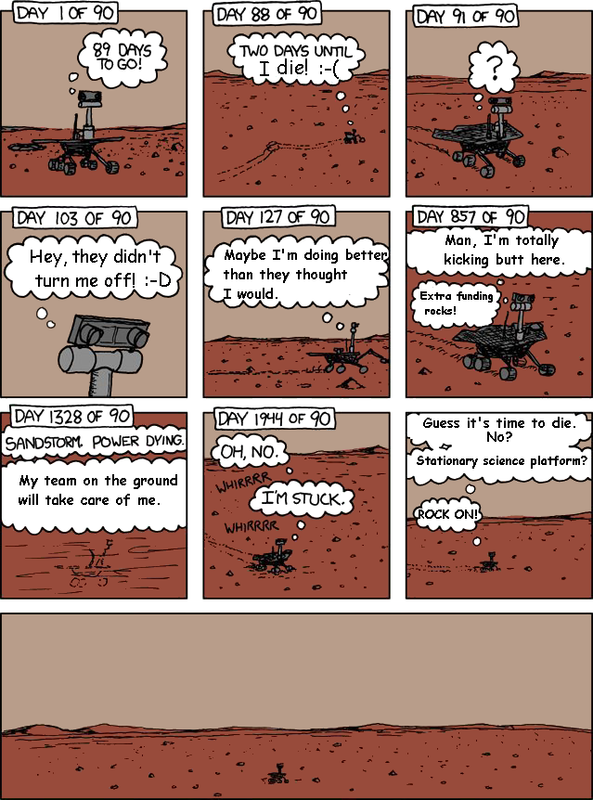 Now, considering how well the Young Wizard books do at personifying inanimate objects, when I heard that Kit was going to meet Spirit, I immediately thought of this xkcd comic, and the response. Unfortunately, we don’t get any actual dialog, with the explanation that Spirit is so sophisticated and has so many security protocols built in that it makes her paranoid when somebody who’s not explicitly authorized talks to her, which makes a bit of sense. Of course, considering the dire situation, they were thinking in terms of making her forget signs of alien life on Mars, not casual chit-chat about how she really feels regarding her mission and never getting to go home. For what it’s worth, I think my interpretation is between the two versions of the comic above, but closer to the latter – if I had to guess how Spirit might ‘feel’ about her mission, I think it’s unlikely she’d have ever gotten the impression that she was going to ‘go home’ after her mission, that she was pleased with all of the extra time that she got to spend travelling on Mars and all of the places she got to go, but still somewhat melancholy about being stuck and low on juice when there’s so much more out there to see. But this is a big side-track from the book, so I’d better get back to the plot. Okay, a lot of interesting things are starting to happen now. Facing the scorpion constructs from her last cliffhanger, Nita gets an uncertain premonition, that kneeling down in front of the lead scorpion will either result in safety or a quick death. She impulsively gambles on it – and the scorpions pass all three of them by. There’s also apparently a wizardry in the archive, helping with the translation, and latching onto Carmela as the person easiest to communicate with. The story that they learn, briefly, is one of a planet between Mars and Jupiter, one where civilization descended into horrible thousands-of-years-long wars, with wizards on both sides helping in the fighting rather than working towards peace with the enemy. Eventually, a rogue planet was discovered, on a close enough approach course to doom this planet, so both sides try to evacuate only their own people, and then fresh hostilities break out when they realize that each was trying to leave the other in the dark. Near the end of the story, Nita and Bobo feed power into the archive wizardry, and they get some visual effects, but the wizardry breaks down permanently just after they get to the point where a few cities are evacuated. This is a fairly short chapter, with an even shorter summary. I’m going to be trying to get the plot summaries to be more concise, instead of relating all the little stuff that happens, but this chapter makes it easy for me. The guys – Kit, Ronan, and Darryl, go to a new Martian crater, one of the ones that the signal from the first egg went to. While investigating there, they see and interact with a bunch of wizardly ‘constructs’ in crazy forms, including fantastic Martian monsters and a ship of astronauts that claim to be from back on Earth. All of those guises, though, are being taken from their own minds, particularly a Mars movie that Darryl saw a long time ago, and they start to speculate on what this might mean. They decide that it’s the wizardries that the original Martians left behind testing them as a kind of self-defence system – if whoever discovers the message freaks out at these manifestations, and either run away or react aggressively, then they fail the test and don’t get to find out more. So they agree to move on to the next site in the message relay, investigating calmly but refusing to back off. That’s about it for the important plot stuff that’s going on, as far as I can tell. So what else really impressed me with chapter seven, in terms of the writing? A few things. One is simply that there seems to be a lot of energy and enthusiasm in the bits with the old Mars movie stuff come to life. I can almost picture Diane having the time of her life as she’s writing it, and that’s certainly endearing to a reader, as long as you can relate at least minimally to that enthusiasm. It reminds me, actually, of an anecdote that the author related in an interview that’s included in the audible.com version of ‘High Wizardry’, when she talks about going to the drive-in as a young girl or something like that, and she got to see “First Spaceship to Venus.” When she was older, she had a friend tape it for her, and was a little shocked that it had managed to capture her imagination so much, since the special effects were so bad. But I guess that she still has a soft spot for old sci-fi movies. Okay, and we’re back to Nita. First, she dreams about the waters of Mars, (not quite like this,) and being drowned by a wave, before waking up. A possibly oracular dream? Then, she has breakfast with her father, chats about what Dairine’s up to, remembers to tell him about Nereid’s invitation to talk, and takes off for Jones inlet. Out in the water, Nita meets her old friend, the whale wizard S’reee, and they chat about several things, including dissolving dangerous land mines away without setting them off, and wizards who are in tune with a particular element, such as water, or fire. Ronan is mentioned as having a water affinity, with his Ordeal referenced, and Nita wonders if her sister is getting a fire affinity, working so closely with stars, and remembering that she was a pyromaniac as a kid. Carmela transits over to the pier just as Nita is coming in, and lays down her plan about going over to Mars to tease the guys before taking Nita shopping at the Crossings for something more stylish than sweaters and jeans. Nita is hesitant to bother Kit and his friends as they male-bond over Mars, but remembers to check his mission precis at this point, and finds out that Kit let the message out of the superegg bottle. She tries to find out more, and finds out that something is blocking all of the sites that the signal energy pulses landed on – the manual can’t find out any more details, and nobody can transit in from Earth. But there’s another Mars site that is showing an active wizardry, and that one isn’t blocked. Okay, we’re back to Kit again. Kit misses Ponch. This was mentioned before, but we’ve got several more references in this chapter about how much Ponch being gone is hitting Kit, and so I thought I’d mention it here. From the ending to “Wizards at War,” I kind of got the impression that though the old Ponch was gone, Ponch would be able to spend time with Kit in his new sheepdog avatar – especially since it had been foreshadowed that nobody knew if the sheepdog had an owner in the neighborhood, back as early as “Wizard’s Holiday.” But that’s a minor point, and I can appreciate the angst of Kit being lonely because his dog’s gone, not to mention that having him actually take part in the plot might make certain things too easy or familiar. We get an indirect answer to my question about Nita going back to Mars after everybody’s gone, too, via a text message in Kit’s manual, which made Kit think that Nita was scowling. And she doesn’t want to be bothered until after lunch, by which time I suspect Kit will be in the middle of other business, and thus our main characters will be separated for a good portion of the book. So Kit’s up in the middle of the night, and antsy about his little discovery on Mars, so he decides to go back. He chats with the Edsel on his way out of the house, (who was mentioned as the source of the antenna back in ‘So you want to be a wizard’, but never shown as far as I recall,) transits over to Mars, and talks with a rock about the weather. And only an American wizard could possibly talk with a rock in the language of the Making, and translate those words into degrees Fahrenheit. Celsius or Kelvin would make much more sense to anybody else from planet Earth. The martian rock, presumably, hasn’t heard of any of them, and would use some kind of absolute scale that’s built into the Speech.